"A Regency time switch. Can Alaina convince her new "husband" that she's not the same as his unfaithful wife? Order electronic book at Amazon.com and Smashwords.com. Order 2002 print version of this book (limited quantities! ): Click here. TIMELESS DECEPTION is on Amazon's List For Recommended Time-Travel Romances With A Beautiful Storyline!! 4 1/2 Stars! [TIMELESS DECEPTION] is ten cuts above any Regency read before. Could it be the time-travel element, the mood, the skill of the author--or all three? Perhaps that and more, for it is an up-all-night, stay-in-the-tub-til-the-water-is cold, entrancing read. Part of what makes it so readable is the juxtaposition of thoroughly modern Alaina's observations on 1817 manners and mores. natural humorous insights pop up throughout, a leavening that rarely appears in most Regencies. The author has an engaging way with her lead characters. Though finding themselves in awkward, even impossible situations, they respond genuinely. Born centuries apart, Alaina and Richard are oh, so likable--and made for each other if they could only see it. The supporting cast adds even more interest and color to the tale, all without overshadowing the hero and heroine. Read TIMELESS DECEPTION. Just make certain you have a long, lazy afternoon and evening ahead of you to enjoy it fully. 4.5 blue ribbons! Susanne Marie Knight has created a time travel romance that is sure to please. Two strong and likeable main characters and a host of wonderful secondary characters make for an enjoyable read. Alaina and Richard make the story come alive. Alaina is smart and brave. She is willing to risk anything for a chance to win her husband's love. Richard is an extremely appealing hero and his son is sure to tug at readers' heartstrings. TIMELESS DECEPTION blends the paranormal with well-crafted characters and a blossoming romance. With vibrant details and complex personalities, Ms. Knight pens a tale that keeps you rapidly turning the pages until the heartwarming end. TIMELESS DECEPTION is an intriguing and original Regency time travel. I thoroughly enjoyed this tale of a modern day woman pulled back in time to Regency England, and meeting the man of her dreams. Mystery, suspense, and romance abound in this novel that readers will be hard put not to devour in one sitting! country house full of servants. And she has really bad taste in decor. to lift the ban. Can he ever overcome the loathing he feels for his wife long enough to see that she's a changed woman? Richard and Alaina are likable characters; he is rather dour, but who can blame him? Alaina is warm-hearted and has a courageous sense of humor in the face of the many challenges before her. The Saybrooke family and their staff are well drawn and add much lively interest to the story. I found the concept of doubles being exchanged through time very intriguing. It's too bad we don't get to see what happens to the real countess in modern New York. One can only gleefully imagine her trying to cross a busy Manhattan street. I recommend TIMELESS DECEPTION as a fast, entertaining read from a versatile author. 5 Stars!! Ms. Knight's book is charming, with wonderful characters, an interesting plot and sub-plots, and vividly accurate historical details. She makes Alaina's quandary believable, and the way the character reacts to the situation has one admiring her moxie. This is certainly a keeper, and a refreshing approach to the same old time-travel piece. I highly recommend this for an enjoyable read and re-read. 4 1/2 Roses! TIMELESS DECEPTION is about being able to judge someone for their actions today and not past mistakes, a love that is being built from sparks that are between the hero and heroine, even though the hero does not want to feel anything towards the heroine. There is a passion in what Alicia believes is right or wrong and she is vocal in her opinions, even helping out others in need. Ms. Knight was able to draw me into the story, make me feel like I was right there along with the hero and heroine. I was able to feel their pain, mistrust, joy, and a love that spanned over two centuries. I thoroughly enjoyed this romp into the past. Ms. Knight has done a superb job of portraying truly delightful characters. The well-researched Regency setting and unique plot will have fans of time-travel romance begging for more! TIMELESS DECEPTION was such a joy to read that I simply couldn't put it down. Ms. Knight promises 'Romance Writing with a Twist' and she certainly delivers with this wonderful Time-Travel Regency I highly recommend this book. 4 1/2 Roses! Ms. Knight has written a wonderful love story, about a man who loved with all his heart, and had to face that the woman he loved was not what she appeared to be. Seeing Richard go from the hard, brittle man he has become, to a loving man, was truly wonderful, and Alaina aka Alicia was a treat of a heroine, thrilled with her newly acquired husband, family and friends... Seeing Richard and Alain fall into love was definitely the focus of the story, and will make for wonderful reading for Regency lovers! 4 Stars! For those of you who enjoy a nice little time travel story - you won't be disappointed in this one. A Regency romance for those who both love the period, and dream about living through an experience like that of the heroine. A very quick, fun read. 4 Stars! This is a great story and could've been twice the number of pages... recommend it for time-travel junkies and look forward to seeing more from this author. TIMELESS DECEPTION is one of the best time travel books that I have read. I love the Regency period and TIMELESS DECEPTION captures the feel of this time. This is a well-written book with great characterizations. Richard, who has been greatly wounded and is afraid to trust, must overcome his fear in order to find happiness. Alaina, a kind and intelligent woman, must adapt to this new time and help Richard to see her true self. Richard's family, who has been affected by Alicia in a detrimental way, must learn to trust Alaina and accept her good intentions. 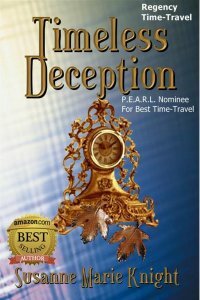 If you are looking for a great time travel book, give TIMELESS DECEPTION a try. 4 Angels! Timeless Deception is a terrific time travel romance. With two very strong leads and a whole host of supporting cast members, it makes for a fulfilling read. The story moves at a nice and steady pace with enough action to keep the reader glued to the pages. If you enjoy time travel romances, Timeless Deception fits the bill! TIMELESS DECEPTION is a lovely Regency story just in time for the holidays. Susanne Marie Knight has written what I refer to as a comfort book.... I really enjoyed this one. The hero, Richard Cransworth, is handsome, strong, and intelligent. Alaina is an outspoken, refreshing change in the household... When you need a break from holiday preparations, I recommend relaxing with this book. It would also make a perfect stocking stuffer for friends or family who like to read. I read Timeless Deception straight through. Ms. Knight's light touch and sense of humor pull you along. Her secondary characters are well developed and add dimension to the story. TIMELESS DECEPTION has an interesting premise, and the way the time travel is introduced is fresh and innovation... I look forward to seeing other works from this author. To order print book: click here.